Annual maintenance improves the operating effectiveness of the dishwasher, which means that it will do a better job of cleaning your dishes. NOTE: The tasks and timings shown here for your Dishwasher are based on a single-family home (owned), located in Massachusetts, United States, with priority set at ‘1 star' or higher, for all possible goals. If you set your personalization differently in your Home Wizard app, then you may get reminders for different tasks and timings in your recommended home care program for your Dishwasher. 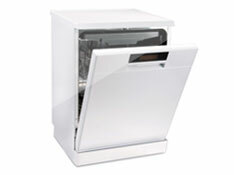 Clean filter and trap: Inside the dishwasher, the filter and trap are at the bottom where the water drains out. For most models, the filter and trap lift out so that they can be cleaned with a stiff brush. Clear spray arm holes: Food particle or mineral deposits can clog the hole in the spray arms. Take the spray arms out of the dishwasher, and ream the holes out with a stiff wire. Shake out any loose debris. Clear the "air trap": Some models have a gap in the discharge plumbing to ensure that water does not backflow into the household water supply. If the unit has an air gap it should be checked and cleaned. Check and tighten any loose water hose clamps. Check the door seal gasket for any cracks or leaks. Check the pre-heating mechanism: If your dishwasher has a pre-heating mechanism for when inlet water is too cold, this should be checked in accordance with your manufacturer's recommendations. The benefits of this task are moderately high. Doing this task can help prevent damage from water leaks, maintains the performance of your water heater, and help extend its useful life. The cost of this task is moderate. It is estimated that this task should take about an hour to complete. You will need a cleaning brush, a stiff wire, and a screwdriver to complete this task.